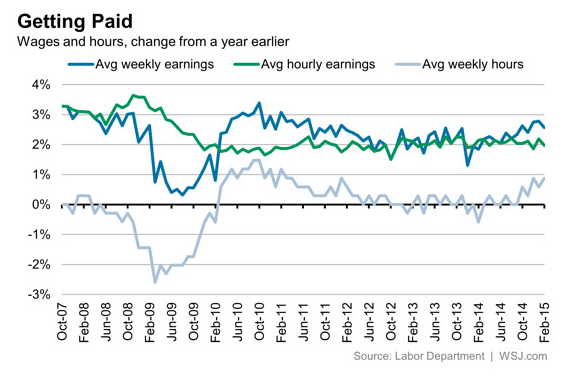 Are We Seeing Weakness In U.S. Jobs Market? Certainly, the last quarter of 2014 performance was strong, but the first quarter saw a decline of 39 percent and this was despite low gas prices that you would think boost consumer spending. However, that has not occurred. It is possible that a stronger U.S. dollar and Middle East turmoil might be finally filtering to U.S. employment figures. A stronger dollar makes U.S. goods relatively more expensive than foreign goods, so that would lead to lower sales and dampened expectations for job growth. Then factor in troubled spots throughout the global economy and that also diminishes outlook for U.S. exporters, who have gained greater influence over the overall economy. So is this temporary or a precursor to further decline? Most industries witnessed little growth, though there were some modest exceptions. 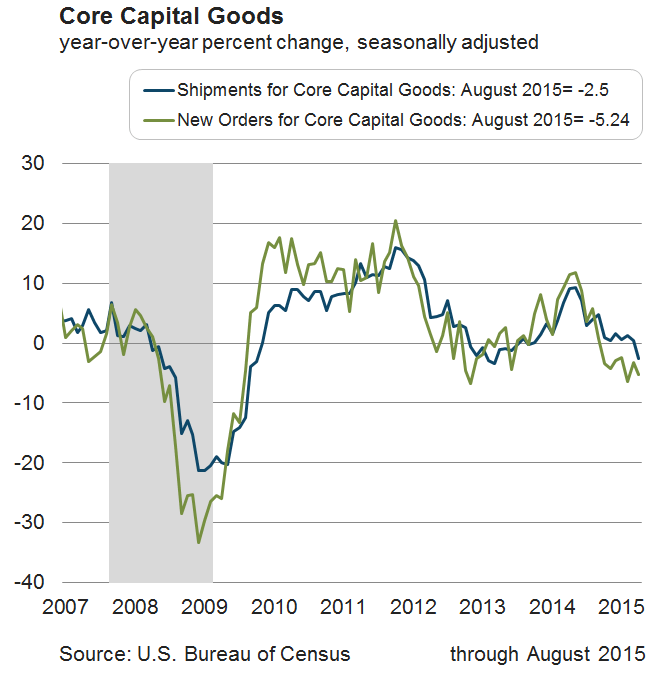 Retail trade employment rose at a similar rate to last year. There are also steady gains in the health care industry. 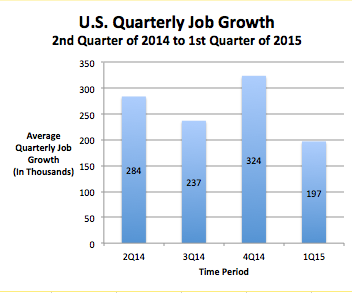 Even though there were job gains in professional and business services, its rate of increase was less than last year. However, there was not much growth in any other sectors. Despite these concerns, there are some positive trends to note. One, the unemployment rate is falling and the labor force participation rate is starting to stabilize a bit. 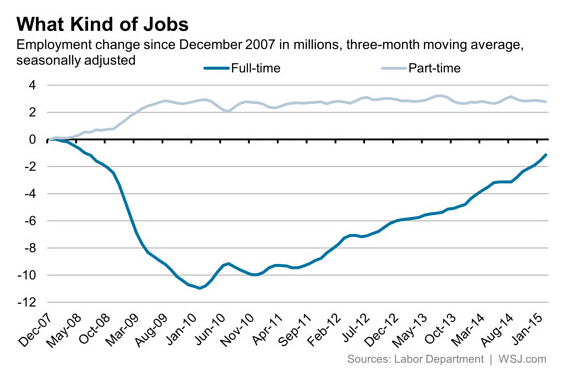 There has been little change in the labor force for over a year. We can see this from the Atlanta Fed graph below. 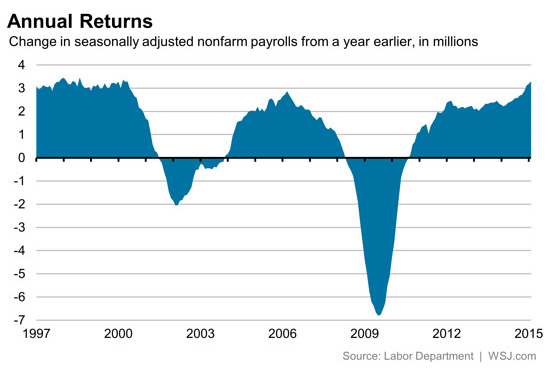 Another encouraging sign is that long-term unemployment continues to fall over the last year. Over the last year, the percentage of long-term unemployment has fallen from 35.3 percent to 29.7 percent. Due to this improvement, a broader gauge of unemployment (U-6) has fallen from 12.6 percent to 10.9 percent since March 2014. On the other hand, there are troubling signs that appear to be on the horizon. 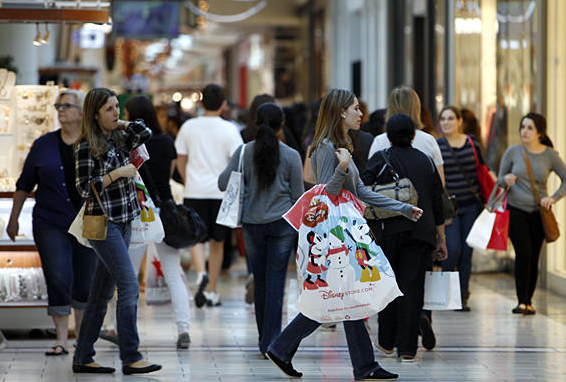 Retail sales, excluding food, have fallen over the last couple of months. With falling gas prices, one would think that it would loosen the pocketbook of consumers, but that has not come to fruition yet. Retail sales have fallen below expectations over the last few months, which suggests that they are not pocketing this new-found wealth back into the economy. A recent slowdown in manufacturing activity may mean that firms are not expecting robust growth this year. That is consistent with a survey of CEOs, who are predicting modest growth that will fall below the 3 percent threshold that would point to good growth. In summary, it appears that the downside risk outweigh the upside risk, so do not be surprised if turbulence returns to the labor market. 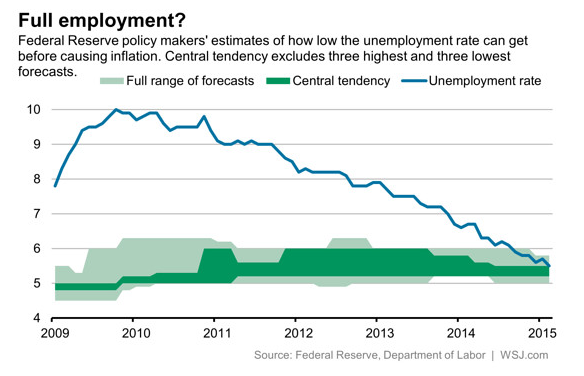 Can monetary policy address U.S. long-term unemployment? Can infer that new Fed Chair Janet Yellen will maintain current monetary policy due to continued labor market weakness, even though the unemployment rate is falling. Impact of U.S. monetary policy can have negative consequences to emerging markets in Asia, Africa, and South America. 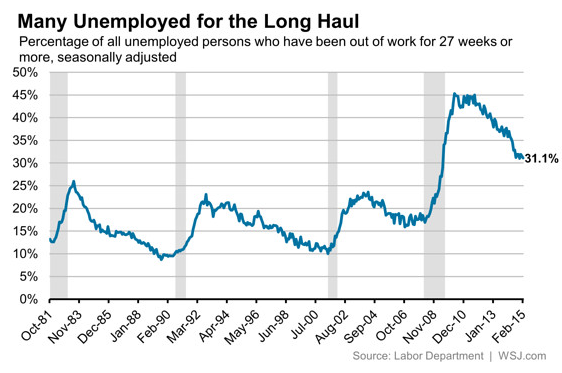 Questionable whether monetary policy can effectively address long-term unemployment. Fiscal policy should be tailored to specifically address the needs of the low-to-medium skilled worker. With Janet Yellen newly confirmed as Chairman of the Federal Reserve, investors are now parsing her testimony to gain insight on the future direction of interest rates. This statement is significant because previous Fed Chairman Ben Bernanke identified a threshold of 6.5% unemployment rate as a starting point for reversing bond purchases aimed at stimulating employment. 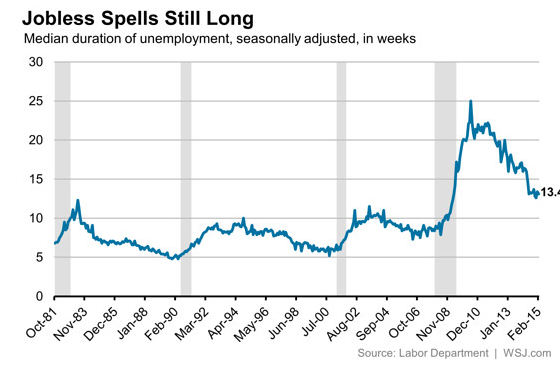 Currently, the U.S. unemployment rate is very close at 6.6%, but it now looks as if the Fed is hedging its bets. The March job report was deceiving. While the unemployment rate fell from 7.7% to 7.6%, there was only modest job growth and a contracting labor force. 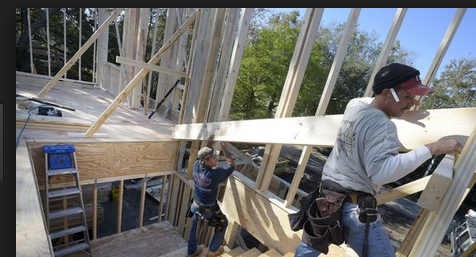 Even though job growth was 88,000, it was far less than projections ranging from 125,000 to 160,000 and just a little more than a third from last month’s rate of new jobs. In fact, the only reason why the unemployment rate did not rise was due to people dropping out of the labor force. 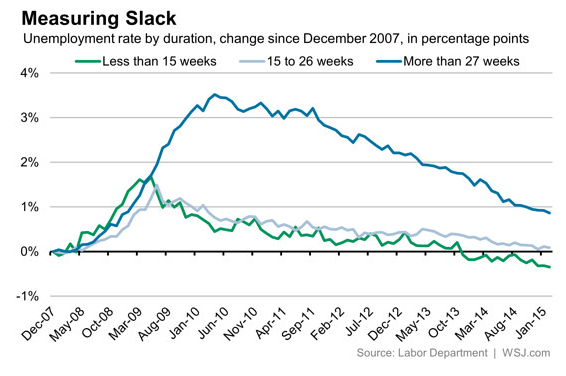 There are a few ways to quantify the extent of the shrinking labor force. The traditional measures include the labor force participation rate and the employment-population ratio. The labor force participation rate answers what portion of the non-institutionalized adult population is either working or actively seeking work. Even though it would not count individuals who are incarcerated or institutionalized with mental illness, it would include those who are happy to not be working, such as a homemaker or retiree. The employment-population ratio is similar, but only focuses on those working in relation to the non-institutionalized adult population. There are somewhat mixed signals with the labor force participation rate falling, but the employment-population ratio remaining stagnant. Over the last year, the labor force participation rate has fallen from 63.6% to 63.3% over the last 12 months, but the employment-population ratio was the same at 58.5% after adjusting for seasonal factors. 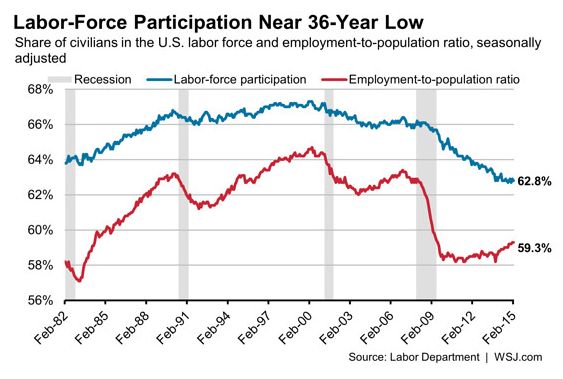 However, a closer look shows that the labor force participation rate trend more accurately reflects the labor market. 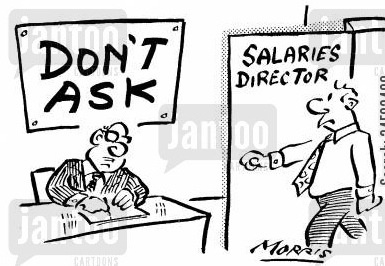 From the Bureau of Labor Statistics, Table A-16, they show that of the 90,483,000 people not in the labor force, 6,399,000 million want a job. That is an increase of 358,000 from last March. If enough people are dropping out of the labor force, then a falling unemployment rate can be misleading. Here is a quick example to demonstrate why. Assume that there are 10 people in the labor force with 8 working and 2 not working. Since the unemployment rate is the number of unemployed workers divided by the sum of workers and unemployed workers (labor force), we would show an unemployment rate of 20% (2 divided by 10). 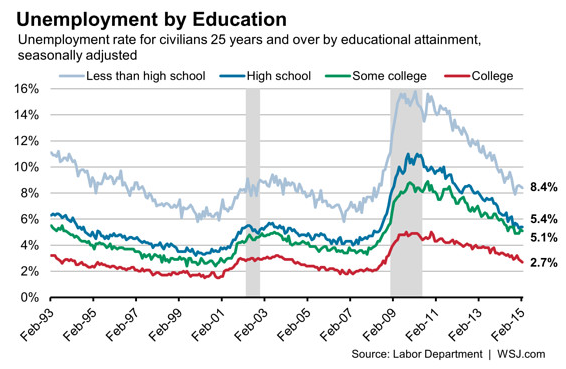 Now let’s assume that one of the unemployed workers dropped out of the labor force due to diminished job prospects. Then that will change both the number of unemployed workers and the labor force. The new unemployment rate would be 11.1% (1 divided by 9). 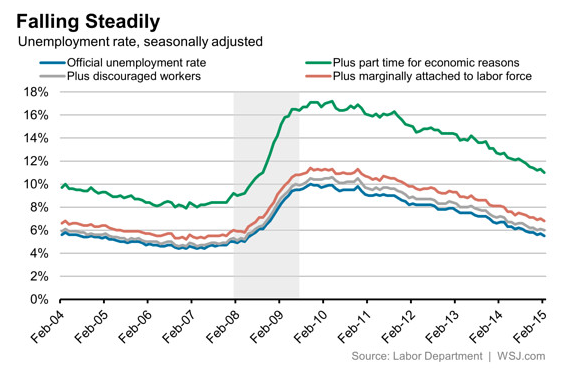 Even though the unemployment rate fell, it was due to a worsening job market not a better one. 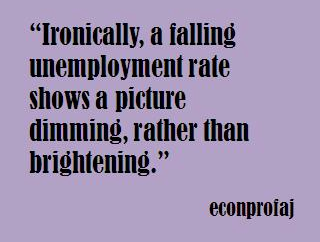 Ironically, a falling unemployment rate shows a picture dimming, rather than brightening.